Fall is trying to sneak its way into Colorado’s back door. We both love fall, but it means a decline in garage sales. So far, we are hanging in there, but it is only a matter of time before we come to rely strictly on the thrift stores and the occasional estate sale. Sigh … a happy/sad time of year. Oh, well, you can cheer up, because a couple of weeks ago, we hit an estate sale that was the mother lode of bad photos for the year! You have no idea how elated we were. Gosh, we are easy to please. Cute as a button, and I bet it still works like a champ. It was amazing how well these old appliances were built. I love my big ole Kitchenaide, but if I didn’t have one, this would fill the bill. These were ALL peignoir sets. Every color of the rainbow and then some. 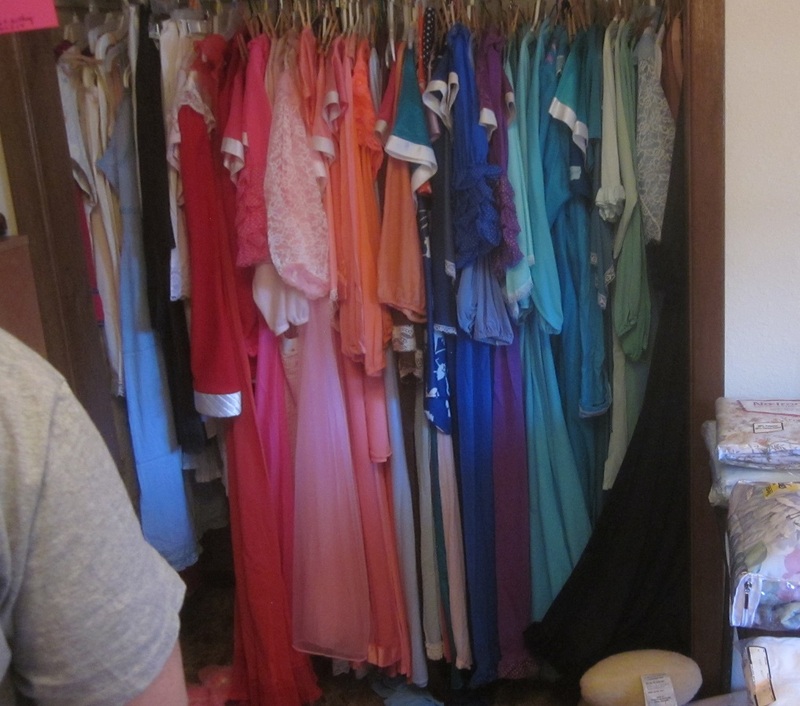 We were pretty sure this gal had a major shopping addiction (We should talk!) 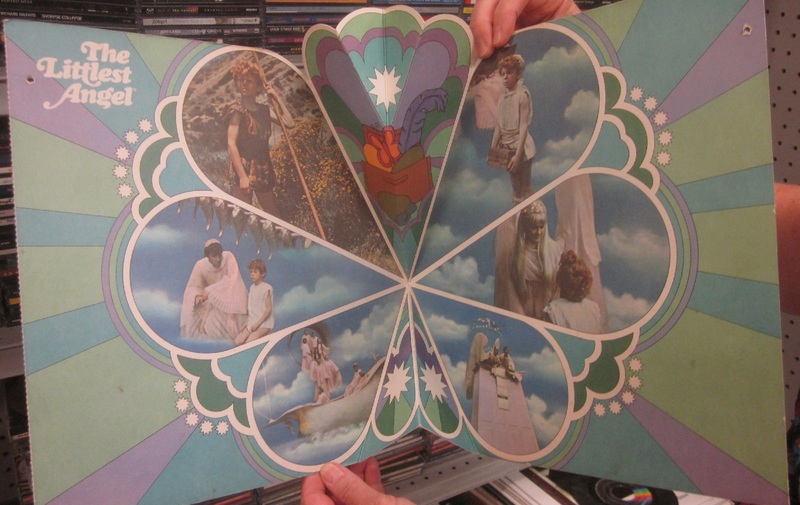 as she had more than one of just about everything. We wonder if she rotated these on a daily basis, or let lover-boy choose which color he wanted tonight! We often wonder just how much of this stuff really gets sold, and if it doesn’t where does it go? 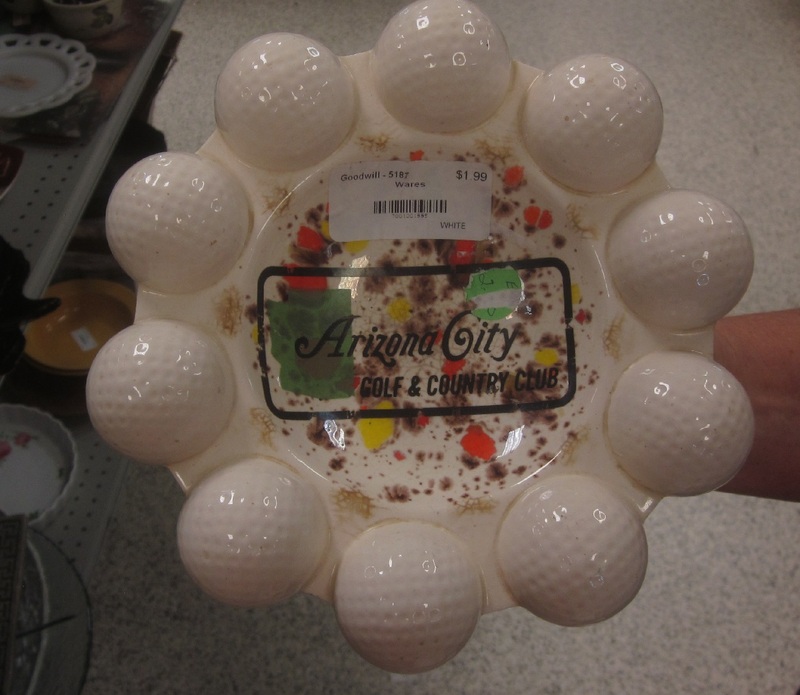 We sometimes see some things at the thrifts that we recognize, but not all of it. It must go live with the lost socks from my dryer. With the right color cushions and the right mid-century modern house, it would look very festive. Just ready for those outdoor bar-b-ques and dry martinis. The plastic cactus in a pot on the table DOES have to go, however. For gosh sakes, why do you need fake cactus? How hard is it to grow a real one? Even most folks with black thumbs can handle that one. 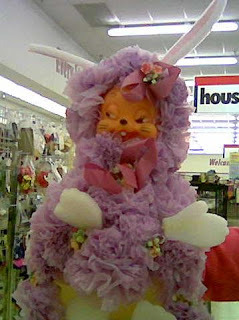 I guess some pink plastic roses would look right at home, and hey, how could they make it any worse? Glad to see the crystal drops on the lamps show up better in this photo. You wouldn’t want to miss those. Wonder if it came with red velvet for the background as well? OK, I have to stop. 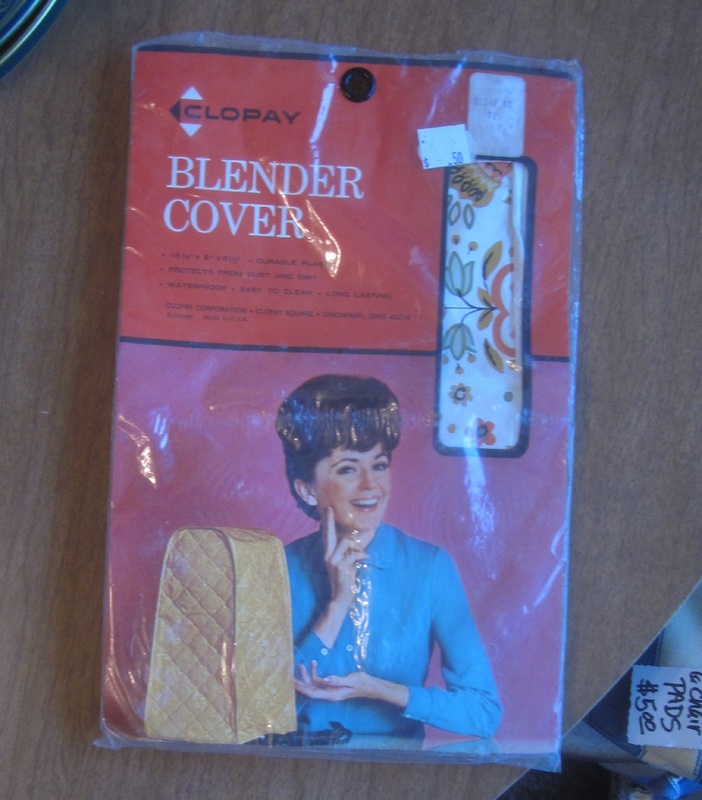 She seems a bit too cheerful, just because she covered her blender. The only reason I can think of, is she was hiding the pitcher of margaritas she just mixed, so she could have them all to herself. I have decided in my mind that this is just what the lady of the house looked like, as she stood in front of her closet contemplating her peignoirs. 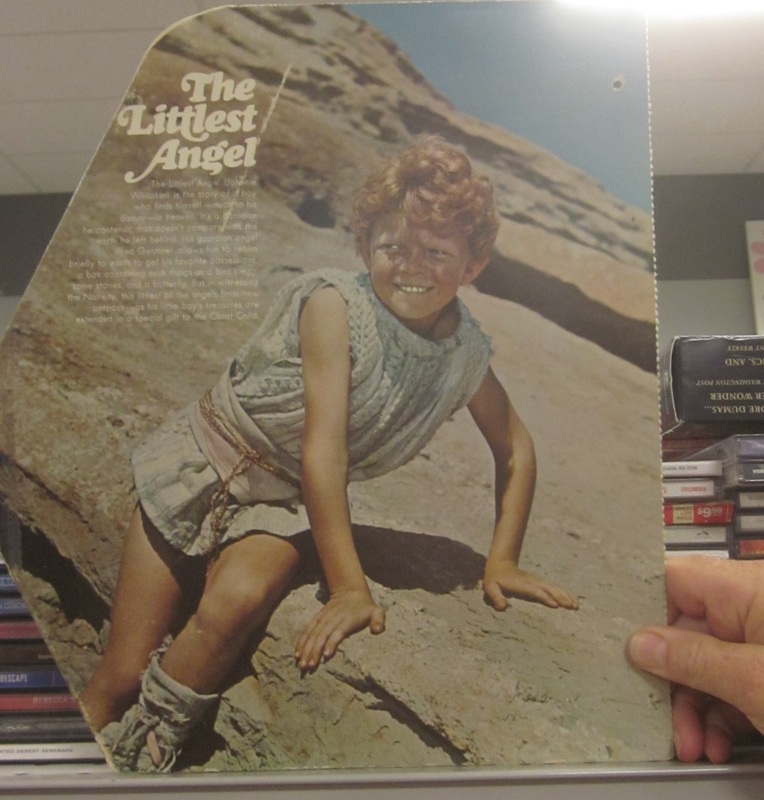 It seemed like a fancy program, and while we were pondering who the littlest angel was, the guy beside us came up with the boy who played Jody on Family Affair. OK, we got that, now what else? 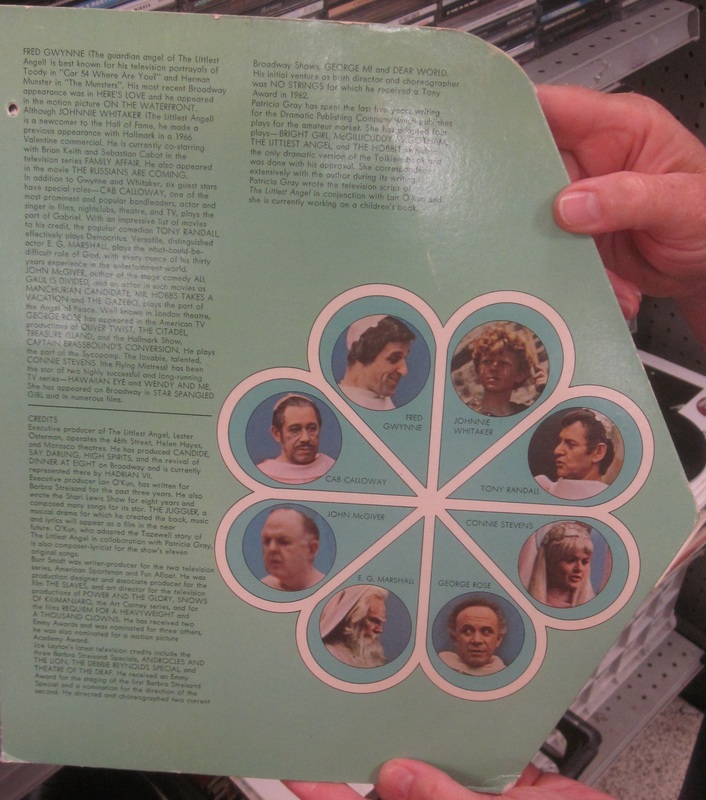 A whole plethora of well known actors of the time, including Fred Gwynne, Cab Calloway, and Connie Stevens. It was originally aired on TV as a Hallmark Hall of Fame show. Somehow, we missed it, but it won awards and everything. What do we know? We are still not sure where the program came from, but we learned something new, I guess. Well, it’s time to get back to those fall chores, the painting is not going to do itself, and soon it will be time to put the garden to bed, and then spend the winter … looking for more estate sales! 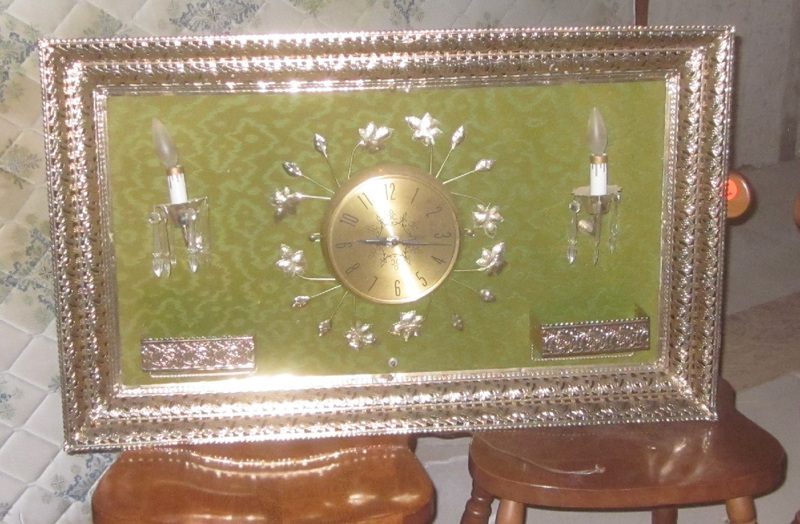 This entry was posted in Friday Finds and tagged Angels/Cherubs, Bad Decor, Estate Sale, Garage Sale, Kitchen items, Lamps and Lighting, Pictures, Thrift Store, Vintage Clothing, What were they thinking. Bookmark the permalink. I haven’t left a comment in a long time but I have been reading you every week. 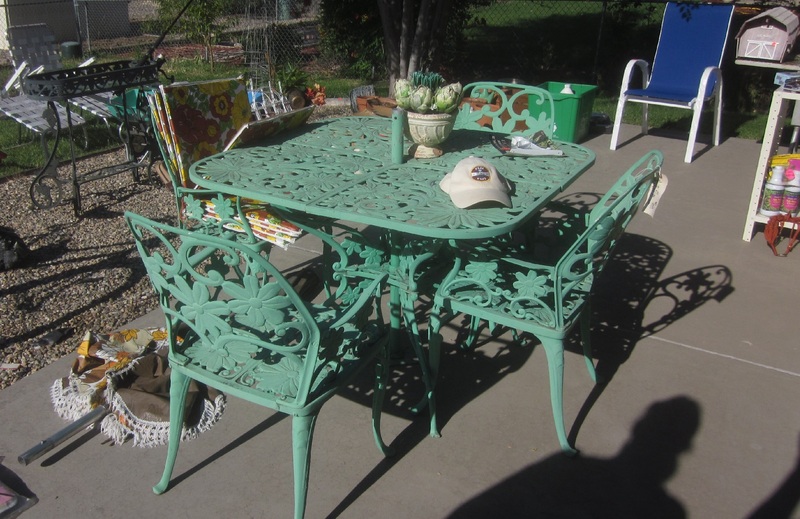 I love that turquoise patio set and if I saw it at a sale, it would be living in my yard already. The built in umbrella stand is a bonus! 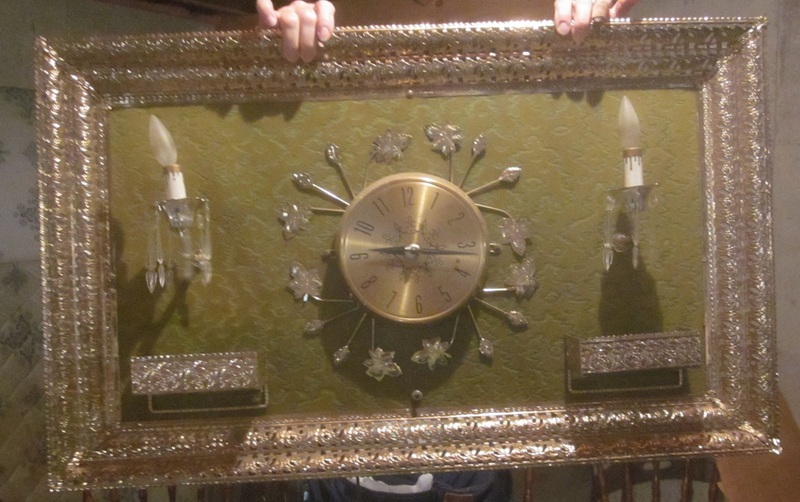 Now that gigantic clock with the sconces and empty window boxes is horrible. But it would take care of a big wall over a couch covered with plastic slip covers. Thanks Karen for coming back for more; it’s the reason we keep writing! We thought the same thing about that hideous clock–surely it perched over some herculon plaid monstrosity. My mom had one of those Sunbeam mixers. It was a workhorse! I made a lot of cinnamon rolls and bread on that mixer. 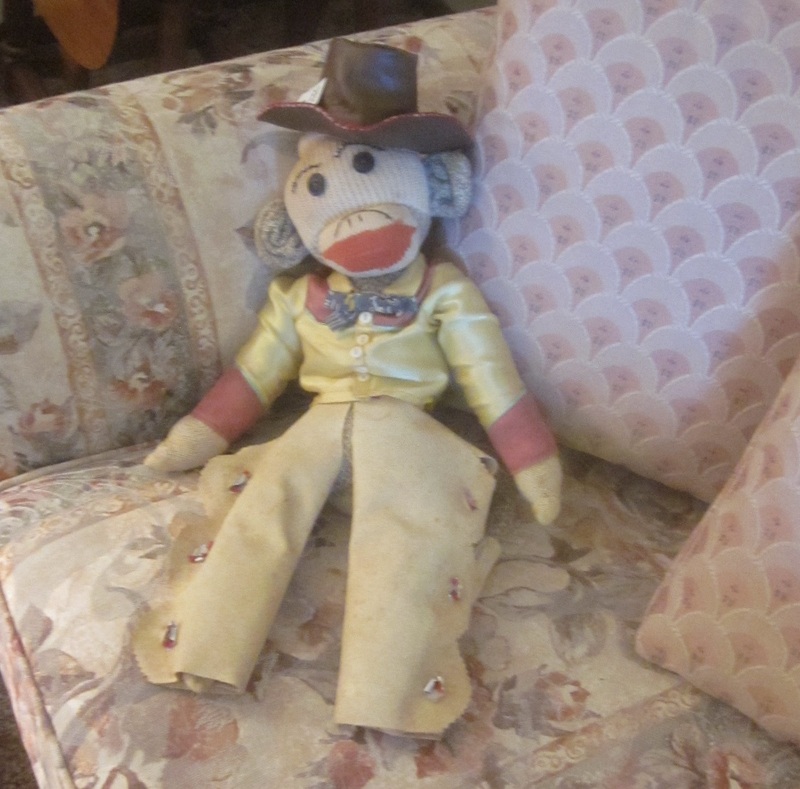 And I think that sock monkey cowboy is adorable. If I was closer, I’d buy it for a friend at work! 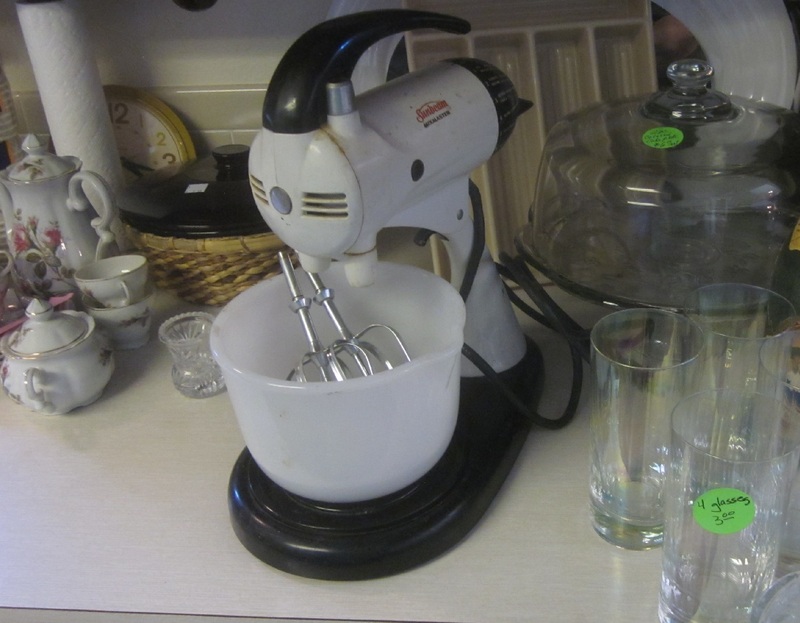 My mom used her mixer for my whole childhood and it probably was still working when she got rid of it; they were practically indestructible! I liked the monkey too; I should have bought it.